Many of you work from home or own your own business, or if not, you have a home office to use for business purposes, such as paying the bills or your own home improvement projects. You want to create the perfect home office interior design that you want to spend time in and have it speak to who you are. Franklin Lighting has been serving the Sarasota community since 1968. We understand home lighting, office lighting, and office interior design. Below, we’ll offer up tips to help get your creative juices going to create the perfect office environment for you. Contact us today for all or your lighting solutions! Consider location in your home. If you put your office in the basement in a room that is nothing more than a glorified closet with a tiny window, do you actually think you’ll spend a lot of time there and be productive when you’re there? You want a space you’ll want to do work in. Furthermore, consider distractions and how you work with noise. You may want your office in a far corner on the first floor away from the pattering feet of your kids. Consider your workflow. 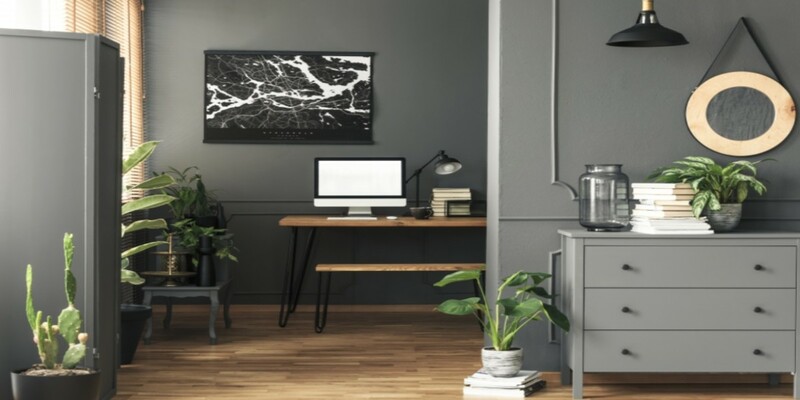 Before you drop money on your office furniture, consider what items you’ll need to accomplish your home office work, as well as how your office furniture will flow with the rest of the interior design of your home. You don’t want a room that screams “sterile office environment” to everyone who walks by. Ideally, you want a home office that is welcoming and cozy. The chair’s the thing. You’ll be spending a lot of time in your office chair, so you want a chair that is ergonomically-correct and comfortable over anything else. Don’t skimp on your office chair; you’ll regret it. Brighten your office with color. Bright colors are cheery, promote happiness, and help with productivity. For your office interior design, choose a color you’ll love to stare at every day and that speaks to you — a deep sea blue to remind you of the ocean or a vibrant spring to remind you of mountain meadows. Surround yourself with beauty. Sometimes work can be overwhelming, disheartening, stressful, and not fun. In those moments, you’ll need a bit of beauty to get you through. Position your desk to face a window if possible, so you can let the natural world cheer you. Hang up artwork that speaks to your soul. Invest in flowers to add a tantalizing scent to the air and a dash of color to your space. Personalize your office space, and make it comfortable. You’ve invested in a comfy chair now accessorize your office interior design. Add a lounge chair and an amazing floor lamp from Franklin Lighting in Sarasota. Invest in a plush blanket for those days you just want to cuddle up and get some work done. Hang photos of the fam on vacation. Bring in your dog’s pillow so he or she will have a comfortable place to lay down and be with you. Hang your vision board on the wall to remind you of where you’ve been and where you’re heading. Bookshelves with your favorite reads and books to read are great additions to your home office for when you need a 15 minute brain break. Organize your office. Most home offices are small spaces, so you’ll want to utilize every square inch in your office interior design. Filing cabinets are not only great ways to stay organized, but they also conserve space. Hang floating shelves on the walls, and invest in baskets for your desk to stack and organize your paperwork. Have one drawer that’s a “to-do” drawer and one drawer that a “junk” drawer. Franklin Lighting in Sarasota offers thousands of beautiful lighting choices in countless styles, materials, and sizes to suit your needs, including for your office interior design. Featured in show homes around the Sarasota area, Franklin Lighting has consistently earned the Sarasota Herald Tribune’s “Best Lighting Store” Reader’s Choice Award. We offer a myriad of indoor lighting options, from ceiling fans, lamps, and wall lights as well as complementary home accents, such as mirrors, vases, planters, and prints. Franklin Lighting specializes in outdoor lighting as well, from scones and gas lanterns to landscape lighting and utility lighting. All of our staff are professionally trained and participate in ongoing conferences to learn about new lighting techniques and products. Our lighting showroom in Sarasota will leave you bright and dazzled. Visit us today!